A long time ago, in a galaxy far far away, there was one mustache that separated itself from the rest. One mustache that rules it all. That mustache is now in the game... TWICE. An elder mustache, already present, showing us that Billy Dee is as cool as the other side of the pillow. And a younger mustache that some may even call Childish, has found its way into Galaxy of Heroes. Accompanied by his L337 droid and a Han-less Millennium Falcon, the younger mustache joins the galaxy to try and find its place among the likes of Luke, Rey, and Ugnaught. What does this new mustached ally provide? What about the droid? A newer fresher Millennium Falcon - will it change the tide of fleet arena? and when will one of the 500 Hans finally get a Millennium Falcon to pilot in this game? 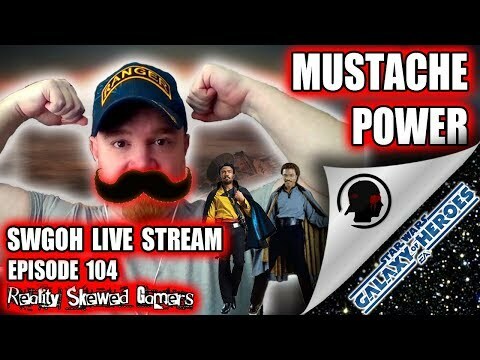 Join us as we discuss this insanity and more in this week's RSG SWGOH Live Stream Episode 104!